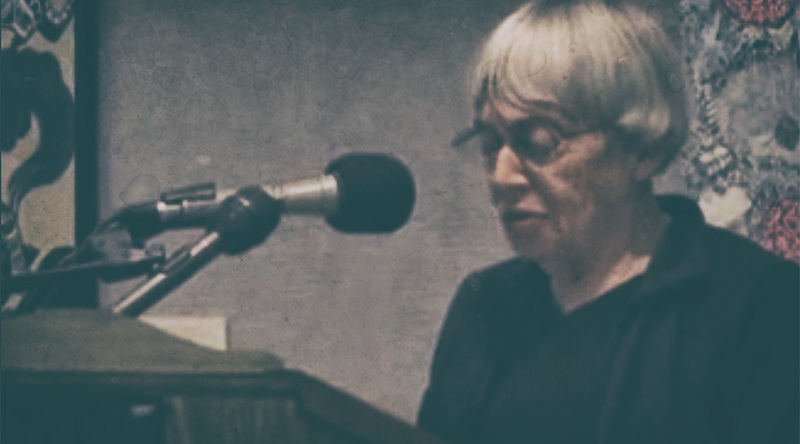 When that interview zine turned into a collection and the book Mythmakers & Lawbreakers: Anarchist Writers on Fiction, I told AK Press, jokingly, that I’d go on a book tour across the entire US if Ursula le Guin agreed to do a talk with me at the end of the tour. She had more or less retired from public speaking. She agreed. I went on a tour. We spoke together at Powell’s Books in Portland. That evening was one of the high water moments of my life. While we were getting set up, someone approached her to talk to her about microphones. She shot that person down, sternly but not rudely, to say that she would not consider anything technical until her husband (more infirm than herself) had a comfortable seat. It stuck with me as one of the most simple and pure expressions of love I’d ever seen. Maybe I read too much into it, I don’t know. But there was this fierceness, paired with love, that I’ve sought to emulate ever since. She was also just nice to me, and there was no reason she needed to be, and we only met that one time, and rarely corresponded, and I’m really, really not used to caring about celebrity death, but I’m going to miss living in a world that Ursula le Guin lives in. In honor of her memory, I’m posting that interview I conducted with her about ten years ago. It was one of the first interviews I ever conducted, and that shows in my questions and my editing, but I think her genius shines through regardless. I talk to her about the role of fiction in changing society, about her anarchism, and even get to ask her about the singular “they” pronoun. Margaret: One of the things that I’m quite curious to explore is the role of the radical as an author of fiction. What do you feel like you’ve accomplished, on a social/political level, with your writing? Do you have any specific examples of change that you’ve helped initiate? Ursula: I may agree with Shelley that poets are the unacknowledged legislators of the world, but he didn’t mean they really get many laws enacted, and I guess I didn’t ever really look for definable, practical results of anything I wrote. My utopias are not blueprints. In fact, I distrust utopias that pretend to be blueprints. Fiction is not a good medium for preaching or for planning. It is really good, though, for what we used to call conscious-raising. Within my field of work — imaginative fiction — I think I have had an appreciable effect on the representation of gender and of “race,” specifically skin color. When I came into the field, the POV was totally male-centric and everybody was white. At first I wrote that way too. In science fiction, I joined the feminist movement when it reawoke in the late Sixties, early Seventies, and we did away with the squeaking Barbies and began to write actual women characters. In fantasy, my heroes were colored people when, as far as I know, nobody else’s were. (And yet I still fight, every single fantasy jacket-cover, to get them represented as nonwhite). Margaret: From the other direction, do you ever feel pressured from the “radical” crowd to be writing “more politically” or along certain lines? Of course I have been scolded by Marxists for not being Marxist, but they scold everybody for not being Marxist. And activist anarchists always hope I might be an activist, but I think they realise that I would be a lousy one, and let me go back to writing what I write. Jefferson thought we already had liberty as an inalienable right, and only had to pursue happiness. I think the pursuit of liberty is what the Left is mostly about. But also, I think if you really want to pursue liberty, as an artist, you cannot join a movement that has rules and is organised. Regarded in that light, feminism was fine — we mostly realised we could all be feminist in our own way. The peace movements, very loose and ad hoc, have been fine. And I can work for things like Planned Parenthood or Nature Conservancy, or a political campaign, but only as an envelope stuffer: I can’t put my work directly in their service, expressing their goals. It has to follow its own course towards freedom. Margaret: Have you encountered any problems, publishing in the mainstream fiction world, on account of your political nature? Ursula: Not that I know of. It is possible that Charles Scribner, who had published my previous book and had an option on The Dispossessed, didn’t like it because he didn’t like the anarchist theme; but I think he really just thought it was a huge boring meaningless clunker and didn’t understand it at all. He asked me to cut it by half. I said no thanks, and we broke contract amicably, and Harper and Row snapped it up — a better publisher for me then anyhow. So I can’t say I have suffered for my politics. SF and fantasy slip under the wire a lot, you know? People just aren’t looking for radical thought in a field the respectable critics define as escapist drivel. Some of it is escapist all right, but what it’s escaping is the drivel of popular fiction and most TV and movies. Margaret: I feel like you do an excellent job of presenting quite radical concepts in stories that don’t feel like propaganda. For example, in the story “Ile Forest” in Orsinian Tales, I believe you undermine the reader’s faith in such ideas as codified law. Ursula: Hah! That pleases me! It is such a romantic story, I never thought of it as having a subversive sense, but of course you’re quite right, it does. Margaret: I might be mistaken, but I’m under the impression that the modern fantasy/sci-fi culture intentionally shies away from politics more than it used to. A lot of magazines, for example, specifically list that they are not interested in works that deal with political issues. Ursula: They do? Wow. That is depressing beyond words. They’re setting up their own wire. Margaret: Have you seen a change in this direction? Ursula: I am just not looking at the market any more. I haven’t written short stories now for quite a while, and if I did, it would be my agent who figured where best to send them. But maybe this is one of the reasons why I’m not reading much SF any more. I pick it up, then I put it down. Maybe I just o.d.’d on it. But it seems sort of academic, almost, lately. Doing the same stuff over fancier, more hardware, more noir. I may be totally wrong about this. Margaret: You’ve perhaps coined one of my favorite one-line descriptions of what an anarchist is: “One who, choosing, accepts the responsibility of choice.” Would you describe yourself as an anarchist? Ursula: Of course I don’t mind! I am touched and feel unworthy. Margaret: What were your first interactions with anarchism? Ursula: When I got the idea for The Dispossessed, the story I sketched out was all wrong, and I had to figure out what it really was about and what it needed. What it needed was first about a year of reading all the Utopias, and then another year or two of reading all the Anarchist writers. That was my main interaction with anarchism. I was lucky: that stuff was hard to come by in the Seventies — shadows of Sacco and Vanzetti! — but there was a very-far-left bookstore here in Portland, and if you got to know him he let you see his fine collection of all the old Anarchist writings, and some of the newer people like Bookchin too. So I got a good education. I felt totally at home with (pacifist, not violent) anarchism, just as I always had with Taoism (they are related, at least by affinity.) It is the only mode of political thinking that I do feel at home with. Margaret: Several books I’ve read or seen — overviews of anarchist history — attribute the first “anarchist” literature to an early Taoist thinker, and include the essay, although I can’t for the life of me remember the title or author. I find the connection quite interesting, however. Margaret: When did the singular “they” fall out of written English? It’s nice to be able to defend the practice. Ursula: Grammarians in the 17th and 18th century, trying to kind of cut a common path through the wild jungle of Elizabethan English, regularised a lot of usages — including spelling — not a bad idea in itself; but they admired Latin so much they used it as their model, rather than looking at how English actually solved some of these problems. “The reader” or “A person” doesn’t agree in number with “they,” and in Latin it is genuinely necessary that subject and verb agree in number . . . so they said it was necessary in English. (Actually it isn’t always, because we have other ways of making the meaning clear, like word order, which is almost irrelevant in Latin.) So colloquial usages such as “he don’t” (which my father, a professor, sometimes used) were frowned out of the written language, and so was the indefinite “they,” even though it turns up in Shakespeare. But the grammarians couldn’t get it out of the spoken language. It is perfectly alive and well there. “If anybody wants their icecream they better hurry up!” So it doesn’t take an awfully big jolt to just slip it back into written English. It is funny how the people who object most furiously to “incorrectness” like that almost always turn out to be far right politically and/or socially insecure.